5th grade's got it goin' on! The 5th grade engages in cool activities that create a link between elementary school and middle school. 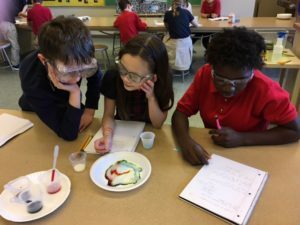 The students will be participating in exciting Science projects such as Inventerprise, 5-7 Science Fair, Zoo, and ONREP Field Trips. Technology, Art, and Engineering are embedded in and enhance these research projects as well as in our historical storyline on the colonization of the United States. 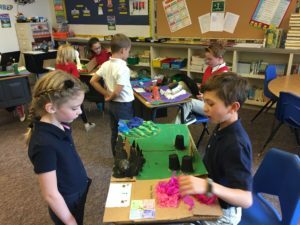 Fifth grade Social Studies culminates the study of the United States that has been in progression since first grade and prepares our students for the enormous content of middle school’s World History. Mrs. Boswell strives to provide creative and engaging learning opportunities. Math in the fifth grade covers concepts such as Order of Operations, Algebraic Expressions, and Geometry. The fluency of basic facts must be achieved for students to move fluidly through these concepts so practice time is built into the day. Language Arts lessons will inspire students to read closely and write for purpose with a strong voice. Book club activities help the fifth graders to communicate on a chosen topic while Break Out activities allow students to team up to collaborate in solving intricate puzzles. Fifth grade is a leadership year at St. Francis. These students are the oldest on the playground and set examples of good sportsmanship. They share their citizenship skills by caring for the school’s flag and their leadership in faith during the annual May Crowning event. Read grade level text aloud, independently with correct pace and expression. Find information in specialized material (examples: online sources, magazines, catalogs). Distinguish between cause-and-effect and between fact and opinion in an expository text. Identify and give examples of the elements of fiction. Understand and use the writing process (pre-write, draft, revise, edit and publish). Write essays and stories across the curriculum that are well organized, supported by details and descriptive. Write texts of different modes (narrative, expository, persuasive) and forms (journals, essays, short stories, poems, etc.) identify and write to audience and purpose. Use correct spelling, grammar, punctuation, capitalization, and penmanship across the curriculum. Deliver an oral message while demonstrating control of eye-contact, volume, rate and expression while using oral, visual and multi-media forms that are appropriate to audience and purpose. Use the table of contents, index, glossary, atlas, almanac, dictionary and thesaurus. Understand how to search for items using the library catalog and local library materials using call number. Create a bibliography using format rules. Identify various media used to convey information. Describe the function of different elements in magazines and newspapers. Respond creatively to lessons taught. Read lives of saints and share with classmates. Reflect on self and the service rendered to others. Demonstrate knowledge and appreciation of the Scriptures. Relates learning to and think critically about real-life situations. Participate in liturgical services, especially Holy Week. Raise questions about Faith in order to learn more. Manifest compassion and concern for others. Read and explain passages from Scripture. Trace themes in the Bible. Explain the symbols of the Sacraments. Discuss characteristics of holiness found in people in the Scripture and today’s society. Discuss the connection between Scripture and one’s own life. Relate historical events and persons to the time of Jesus and the early Church. Order, model and compare common fractions, decimals and percentages. Recognize characteristics of odd, even, prime and composite numbers. Divide by two digit numbers. Add, subtract, multiply and divide order fractions, decimals, percentages and whole numbers. Model percentages to determine equivalent decimals. Understand and use mean, median, mode and range. Understand basic concepts of sampling. Represent and interpret data using tables, circle graphs, bar graphs and plot graphs. Connect simple fractional probabilities to events. Represent and analyze patterns and functions using words, tables, graphs or simple algebraic expressions. Represent the idea of a variable as an unknown quantity using a letter or symbol. Represent and evaluate algebraic expressions involving a single variable. Know conversion between Fahrenheit and Celsius temperatures. Develop and use formulas for determining the perimeter and area of rectangles and related triangles and parallelograms. Use metric measurements to make estimates of length, weight, and volume. Identify, describe, compare and classify triangles by their sides and angles. Accurately draw and label triangles, angles and line segments using measuring tools. Identify and build three-dimensional objects from two-dimensional representations. Understand and measure acute, right and obtuse angles in degrees. Know states of matter (solid, liquid, gas, plasma, heating, cooling). Know that cells: need food, water, air and are visible using a microscope. Describe life cycle and survival of organisms. Identify stars and planets, the Earth and moon’s orbits. Understand recycling and its impact on the environment. Understand and use the scientific process. Describe interactions among parts of a system. Construct a model of a real thing. Know ways and places people practice science. Know how new observations may resolve differences in explanations. Know that inventions are likely to lead to other inventions. Know the effect of choices on the availability of natural resources. Understand how scientific developments can help keep us safe. Know that tools are used to gather scientific information. Understand how the use of technology in solving problems can cause new problems. Recognize the need for age-appropriate hygiene. Introduce male and female reproductive systems. Understand how the branches of federal government work. Know how the U.S. makes treaties with other nations. Know how federal laws are made. Identify essential ideas of U.S. government, the Declaration of Independence and the Constitution. Identify basic rights given to U.S. citizens and how individuals can participate in the democratic process. Understand how U.S. has interacted with other nations in our past (examples: France, England, Spain). Identify functions of federal states and local governments. Understand nature of war and conflict. Recognize that people earn income by exchanging labor for wages and salaries. Understand exchange of goods and services among colonists and Native Americans. Recognize that all nations interact through trade. Know that a budget is a record-keeping plan for managing income. Trace the development of technology and the impact of major inventions on business productivity. Identify major landforms, bodies of water, vegetation and climates of U.S., principal parallels and meridians (examples: equator, arctic circle). Understand how physical geography affects migration and settlement patterns. Know ways Native Americans and early settlers adapted to and changed the environment. Use maps and other visual representations. Understand the causes, course, and impact of the American Revolution. Know contributions of North American peoples from prehistory through the period of the American Revolution. Gather, use and document information from multiple sources (examples: print, electronic, human, primary, secondary). Examine one issue, event or problem through inquiry and research. Recognize simple technical and organization elements and understands the emotional impact that music can have. Use appropriate music terminology in explaining various technical and organizational elements of music. Utilize personal preferences and their relationship to music elements. Demonstrate their ability to plan an instrument as part of the band. Describe using appropriate technical terms, how different materials, techniques, and processes cause different effects and responses. Describe ways an artwork reflects the artist’s experiences and/or culture. Demonstrate the use of a foot dribble, hand dribble, strike, throw, catch and volley. Perform one dance or rhythmic activity to music. Demonstrate improvement in a new motor skill. Use basic offensive and defensive roles in physical activities, games or sports. Identify rules and procedures in specified physical activities. Identify changes in his/her body during moderate to vigorous exercise (examples: perspiration, increased heart rate, and breathing rates). Identify and assess fitness components. Explain and demonstrate safety, rules, and etiquette to be used in physical activities. Mrs. Beth Boswell has a degree in Education with an endorsement in Physical Education from the University of Portland. Beth chose the teaching profession partly because her parents were both teachers and she enjoyed “playing school with her younger brothers and neighborhood friends”. Recreating in the beautiful Central Oregon outdoors with her family is her favorite pastime. The Boswell family moved to Bend from Portland in 1989. She has three grown children who all attended St. Francis. Mrs. Boswell has taught PE, 4th and 5th grade and 6th grade Math. She is the school’s Athletic Director and is sometimes coaches our Track and Field teams. She enjoys it all. 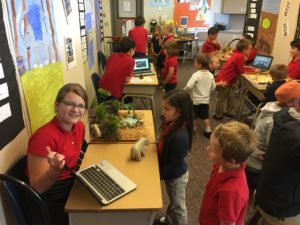 With over 2000 hours of Professional Development in subjects such as, Read Well and Write, Creative Mathematics, Storyline, OTAG, ONREP and Tech Training, Mrs. Boswell concentrates on creating a classroom environment that is stimulating, encouraging and supportive based on Trust, Respect and Dignity. She creates a digital learning environment using a variety of technologies for all areas of education that help students reach their full potential. Mrs. Boswell demonstrates skill in individualizing instruction based on student’s needs and interests. She wants learning to be exciting and fun, she treasures the moment when she ‘sees the light click on’.